Not many of the digital audio players on the market record, and most that do have pretty limited quality and/or require an add-on adapter. This nifty gadget is principally a recorder (it does also play, of course) and will appeal to audiophiles who like handling a microphone now and then, as it will store uncompressed 24-bit, 44.1 or 48kHz-sampled audio, as well as in MP3 form. Using interchangeable SD cards gives a capacity of over six hours from the single 4GB variety. 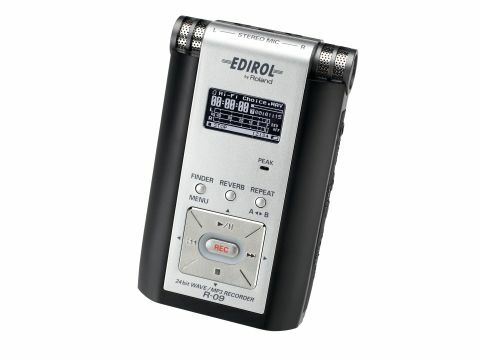 And, with battery life good for over nine hours of recording (from high-capacity Ni-MH cells in our own tests), and good quality microphones built in, it's both a supergrade dictation recorder and the handiest bootlegging device we've ever seen (we didn't say that). Unlike MD, it's mechanically silent and the display and controls are far nicer than any MD recorder we've used. The surprise, though, is the audio quality: via line in, performance is most commendable, with distortion and jitter hardly worse than in professional A-D converters and noise perfectly acceptable. The mic input is hardly less impressive and the output is also very clean, making this both a serious recorder and an exceptionally upmarket digital audio player. We took it to a couple of professional sessions and were frankly blown away that such a tiny device came so close to equalling our regular bulky kit in sound terms. The only features we might ideally add would be digital input and some way of automatically dividing tracks on record. Basically, though, we lurve it.